Dec 2010 – Bouncebackability Rules. 3 Random Football Factoids of the Day*. Roy Makaay of Bayern Munich has so far scored the fastest goal ever in Champions League history, after beating Real Madrid’s Iker Casillas to score after only 10.20 seconds. The first football fans to actually sing the song ‘You’ll Never Walk Alone’ was Manchester United fans (gasp! ), after the Munich Air Crash in 1958? Liverpool fans ‘formally’ adopted the song for the club 5 years later, in 1963. During the 2005 Champions League Final Post-Match Celebrations, Milan Baros accidentally dropped old Big Ears and dented the trophy? Curiously, Liverpool chose not to have the dent repaired. The Twelve Days of Christmas…Football-Style! A framed pic of Spain NT. and A framed pic of Spain NT. HAVE A HAPPY & BOUNCEBACKABLE HOLIDAY SEASON! 2. Michael’s only the 4th Player since WWII to play for both Liverpool FC and Manchester United FC. 3. His best friend is also named… Michael. 4. He’s a licensed helicopter pilot, doing the training course after signing for Newcastle United so he can go to work in Newcastle and still come home to his family in Wales. 5. He’s the only player in recent football history to have worn BOTH Liverpool FC (during Jamie Carragher’s Testimonial match, September 2010) and Manchester United shirts in 1 season. It was love at first goal, basically. 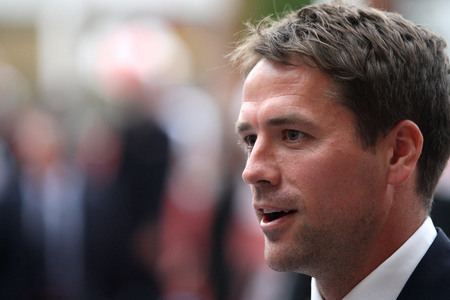 That fresh-faced goalscorer’s name was Michael Owen. And thus, my love affair (albeit one-way) with him, Liverpool FC, and England NT began. The Future of English Football, circa 1997. Fast forward several months later and World Cup 1998 was the buzz. For the first time in my country’s history, matches were shown on free TV, although on a delayed basis, but I did not mind at all as it gave me the opportunity to follow Michael and England NT’s journey. 216 Appearances, 118 Goals. From 1997-2004, He was Liverpool’s Main Man–The One the squad relied on for inspiration and hope even from the direst of situations. And despite his youth, he stepped up and deliver like a seasoned pro. The Spark that ignited an amazing Liverpool comeback, circa 2001. 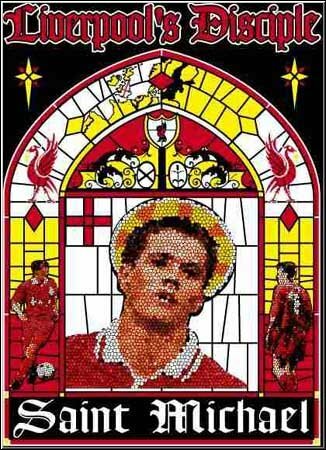 St. Michael of the Anfield Faithful. 89 Appearances, 40 Goals. From 1998 to 2008, England saw Michael break record after record: Previously holding the title of Youngest Ever Senior England Player of the Century, Youngest Senior Goalscorer, and currently he lies 4th in the table of England’s Greatest Ever Goalscorers. The Hattrick Hero that shattered German hearts and egos, circa 2001. 35 Appearances. 13 Goals. The summer of 2004 was when he decided to leave Liverpool for the sunny climes of Spain and the proverbial greener grass of Real Madrid CF. It broke my heart in a million ways to see him play for another club in a different league and country, but in the bigger scheme of things, how can you blame him for wanting to experience playing alongside Zinedine Zidane, Raul, Ronaldo (the original one, not the greasy, diving cad), Figo, Casillas, and Beckham? Real Madrid President Fiorentino Perez then declared that Owen “fits perfectly into the Real Madrid style both for the way he plays and his extraordinary behaviour”. After Luis Figo in 2000, Zinedine Zidane (2001), Ronaldo (2002) and David Beckham (2003), Michael was the summer’s star signing, even if Marca, Madrid’s local sports daily, turned up their noses at him and wrote, “Let’s face it, Owen is not a galactico” – a verdict it conveniently revised after the ex-Liverpool forward scored his sixth goal in eight appearances. “Owen is an authentic killer,” they sweetly sang. But perhaps the first verdict was spot on, Owen is not a Galactico because he is an authentic English Fox, there to play the best football he can, not a money-making machine nor a pawn for political aggrandizement. Who says Englishmen cannot do well in the Primera Liga? He had the Best Goals-to-Playing Time Ratio in the League that season. Only internal strife and politics prevented him from fulfilling his real potential. 71 Appearances. 26 Goals. His brief flirtation with a foreign league ended when Newcastle United broke their transfer fee record and brought him to Geordieland for a whopping 16 million pounds. The transfer made headlines yet again as Liverpool fans felt slighted and snubbed, but with limited funds and a manager unwilling to yield, Michael’s desire to don the Red shirt once more did not translate into reality. The reality was that the Toon welcomed him with open arms and he soon became their new “Messiah”, but a brilliant goalscoring run on his first season was broken by a foot injury sustained during their Christmas fixtures, and hereonafter, his time at the Toon had been a mixed bag of fortunes. His time at Newcastle may have had more downs than ups, but when he’s available he made sure he did his part. 2009 became a landmark year for Michael, as his contract with Newcastle United expired and speculation rose exponentially on which club will take a gamble on him. Senior players of Liverpool FC made it no secret that they want their ex-teammate back, and considering Anfield’s goalscoring crisis, coupled with Michael being a free agent, it seemed a sensible match. However, July 3, 2009 was the day I found out that Michael has officially signed with Liverpool FC’s biggest rival club, Manchester United, and truth be told, the choice, and the sheer surprise, speed, and randomness of the events had actually rendered me speechless for a few minutes. Fast forward to the present, and while the Liverpool supporter in me is still hurt whenever I see him play wearing the crest of Manchester United, the Owen supporter in me is happy to see that he has had moments of brilliance for his new club, most notably his derby winner against Manchester City, his equalising goal vs Aston Villa in the Carling Cup Final, and his hattrick vs Wolfsburg in the Champions League. The Move and the Shirt Number that will live on in Football Infamy for many years to come. It is far too easy to spout Opta Joe and Wikipedia-esque stats, but the bottomline is that his achievements in such a short span of time speak volumes about how extraordinary his footballing talent is, and anyone who has the gall to say anything contrary deserves a swift lobotomy. For some, his career decisions remains an enigma: Does the end truly justify the means? His ability to uphold a steely sense of self-containment is often misconstrued as disloyalty, selfishness and greed, but if one considers the number of hardknocks and sucker-punches he has taken in the chin with virtually no complaints, you’d be hard-pressed not to admire his brand of determination and conviction. By now, he is well and truly cognizant of the fact that he is a polarizing figure in football, but he’s also shrewd enough to know that he owes no apologies to anyone for his decisions. It’s not as simple as black and white, it’s different shades of green and sometimes even yellow and red–that’s Football. The quality I admire most about him above all is that he is a fighter and a survivor. He faces all career storms with quiet dignity and even wry humour. When everything else points to the negative, he keeps his head down and just keeps on working. I firmly believe he is one of the last old-school, thinking-man’s footballer in this era, a breed that is sadly quickly becoming extinct. You can’t keep a good man down. Criticisms and injuries come and go, but true talent will always prevail. Setbacks may bruise him, but he’ll never be knocked out. Son. Brother. Husband. Father. Friend. The man who can break my heart in a million pieces but who knows how to glue it all back together as if nothing ever happened. Icon of his Football Generation. Newcastle United’s #7 and resident Bad Boy Joey Barton’s favourite karaoke song has been recently revealed– Seems he couldn’t help himself when he came face-to-face with Liverpool’s Golden Boy Fernando Torres and belted out “…when I think about you, I touch myself” during their match this weekend. Barton actually used more obscene gestures and he probably said a boatload of expletives as well. My, my, Joseph. Santa will NOT be pleased. You can expect a truckload of coals inside your stocking this Chrimbo. P.S. If the FA decides to suspend Barton because of that incident, then they have lost the plot. A fine would suffice for that sort of petulance, but not suspension. Torres took the actions like a man and let’s face it, characters like Barton make matches a lot more interesting to watch. Haiku no. 6: There’s a New Torres in Town. For someday, he’ll roar proudly.